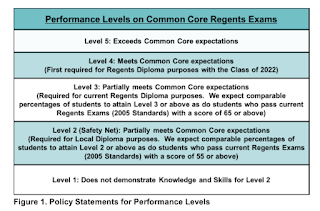 As people boil the oil and man the ramparts for this decade's education-reform efforts, I've gotten more questions recently about what I think regarding Common Core. Fortunately, I had a chance to look at it recently as part of CUNY's ongoing attempts to refine our algebra remediation and exam structure. (1) I think the standards look great. Everything that I've seen in the standards themselves looks smart, rigorous, challenging, core to the subject, and pretty much indispensable to a traditional college curriculum in calculus, statistics, computer programming, and other STEM pursuits. I encourage you to read them at the link above. It includes pretty much everything in a standard algebra sequence for the last few centuries or so. I like the balanced requirement to achieve both conceptual understanding and procedural fluency ( http://www.corestandards.org/Math/Practice/). As always, my response in a lot of debates is, "you need both". And this reflects the process of presenting higher-level mathematics theorems: a careful proof, and then applications. The former guarantees correctness and understanding; the latter uses the theorem as a powerful shortcut to get work done more efficiently. I like what I see for sample tests. Here are some examples from the nation-wide PARCC consortium (by Pearson, of course; http://parcc.pearson.com/practice-tests/math/): I'm looking at the 7th- and 8th-grade and Algebra I tests. They all come in two parts: Part I, short questions, multiple-choice, with no calculators allowed. Part II, more sophisticated questions, short-answer (not multiple choice), with calculators allowed. I think that's great: you need both. 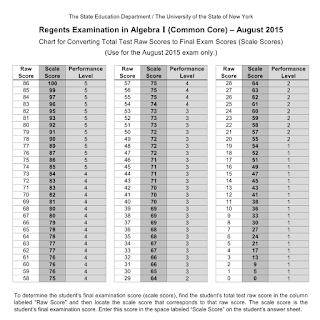 New York State writes their own Common Core tests instead of using PARCC, at least at the high school level (http://www.nysedregents.org/): here I'm looking mostly at Algebra I (http://www.nysedregents.org/algebraone/). Again, a nice pattern of one part multiple-choice, the other part short-answer. I wish we could do that in our system. 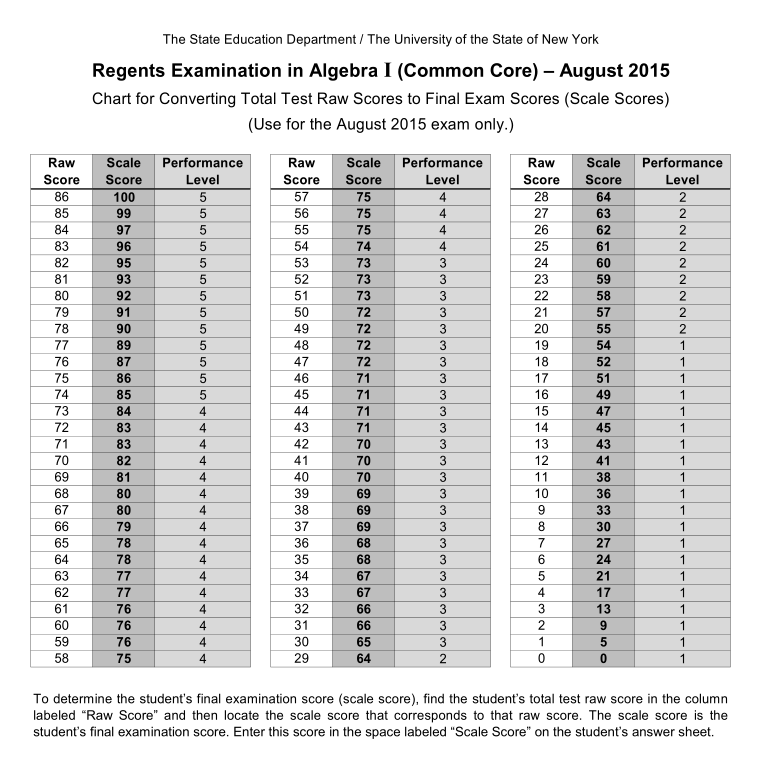 Now, the NYS Algebra I test is all-graphing-calculator mandatory, which sets my teeth on edge a bit compared to the PARCC tests. Maybe I could live with that as long as students have confirmed mental mastery at the 7th- and 8th-grade level (not that I can confirm that they do). Even the grading rubric shown here for NYS looks fine to me (approximately half-credit for calculation, and half-credit for conceptual understanding and approach on any problem; that's pretty close to what I've evolved to do in my own classes). In summary: Pretty great stuff as far as published standards and test questions (at least for 7th-8th grade math and Algebra I). (2) The implementation is possibly suspect. Most teachers in grades K-6, and even 7-8 in some places (note that's specifically the key grades highlighted above for "some of the highest priority content for college and career readiness") are not mathematics specialists. In fact, U.S. education school entrants are perennially the very weakest of all incoming college students in proficiency and attitude towards math (also: here). If the teachers at these levels fundamentally don't understand math themselves -- don't understand the later algebra and STEM work that it prepares them for -- then I have a really tough time seeing how they can understand the Common Core requirements, or effectively select and implement appropriate mathematical curriculum for their classrooms. Sometimes I refer to students at this level as having "anti-knowledge" -- and I find that it's much easier to instruct a student who has never heard of algebra ever (which sometimes happens for graduates of certain religious programs) than it is to deconstruct and repair incorrect the conceptual frameworks of students with many years of broken instruction. Before I go on: The best solution to this would be to massively increase salary and benefits for all public-school teachers, and implement top-notch rigorous requirements for entry to education programs (as done in other top-performing nations). A second-best solution, which is probably more feasible in the near-term, would be to place mathematics-specialist teachers in all grades K-12. Now, this is a test that had a maximum total 86 possible points scored. If we linearly converted this to a percentage, we would just multiply any score by 100/86 = 1.16; it would add 14 points at the top of the scale, about 7 points at the middle, and 0 points at the bottom. But that's not what we see here -- it's a nonlinear scaling from raw to final. The top adds 14 points, but in the middle it adds 30 or more points in the raw range from 13 to 40. In summary: While the publicized standards and exam formats look fine to me, the devil is in the details. On the input end, actual curriculum and instruction are left as undefined behavior in the hands of primary-school teachers who are not specialists, and rarely empowered, and frequently the very weakest of all professionals in math skills and understanding. And on the output end, grading scales can be manipulated arbitrarily to show any desired passing rate, almost entirely disconnected from the actual level of mastery demonstrated in a cohort of students. 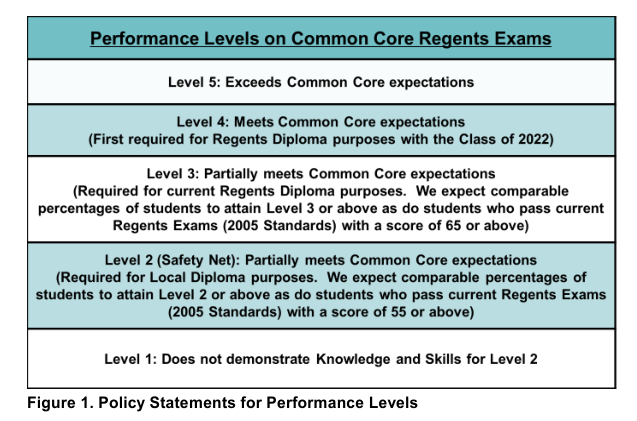 So I fear that almost any number of students can go through a system like that and not actual meet the published Common Core standards to be ready for work in college or a career.